With a slick black-and-white urban theme, HQ Hostel aims for trendy, tech-savvy twenty-somethings. The name stands for “headquarters” and indeed the vibrant Silom location makes a great base for exploring the city. It’s not the biggest or cheapest hostel in town, but HQ isn’t a bad choice for those wanting to stay in Bangkok’s modern side. In an area where real estate is among the priciest in Thailand, it’s no surprise that HQ makes do with relatively cramped space. Occupying four industrial-chic floors that incorporate no shortage of polished concrete and messages like “YOU ARE AWESOME” stenciled onto stark white walls, the hostel aims for a sleek, minimalist design that lacks any hint of cosiness. Beware if you’ve had a few drinks or are just hopelessly clumsy; the stairs are a bit slippery and low-hanging concrete passageways warrant “watch your head” signs. Unfortunately, the central location translates to tight spaces. 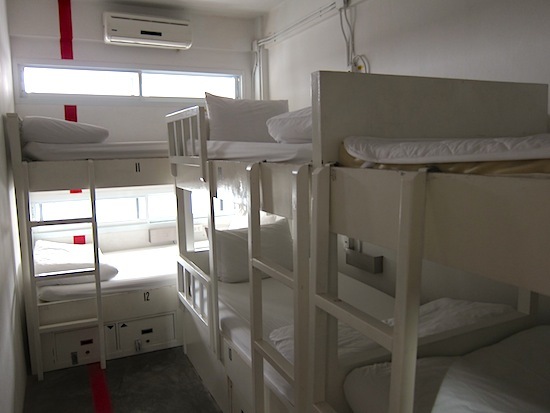 All dorms come with thin mattresses on wooden bunks that have been painted white, with random strips of colour to contrast flush white walls and more polished concrete. Cleanliness is very well looked after. Each bunk is equipped with personal reading lamp, electrical outlet, digital lock box and small drawer. White stained glass windows with no curtains allow the morning sun to filter inside. While the cool atmosphere will be a blessing on scorching hot days, there’s not a lot of space to move around. Mixed dorms come with a choice of four, six or 10 beds, with prices getting higher as number of beds gets lower. There’s also a six-bed women-only option. Immaculate shared bathroom facilities have several shower rooms with rain-shower heads to go with modern sinks and toilets. 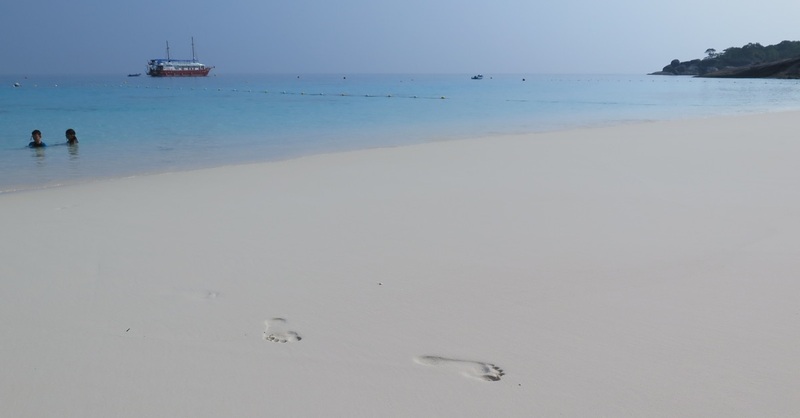 All rooms are accessed with a key-card and equipped with air-con. For 990 baht, a small double private room has only a narrow desk to accompany a bunk bed for two travellers, and it relies on the shared bathroom facilities. The slightly larger 1,190 baht private has a peculiar setup that relies on a long, white curtain to separate a double mattress on a raised polished concrete platform from the disproportionately big ensuite bathroom. Both constitute reasonable value for this location, though we were told that rates might fluctuate slightly at different times of year. When it comes to common areas, HQ makes the most of limited space. The focal point of a shared bean bag lounge is a wide LCD TV with several English channels and an impressive DVD selection. Downstairs, a small cafe/chill space has free WiFi, a couple of communal computers, book exchange and tour desk. On an upper floor landing, an out-of-place but perfectly welcome exercise bike and elliptical machine sit in the corner. The stylish young staff fit seamlessly into the contemporary theme, and we found them friendly enough. 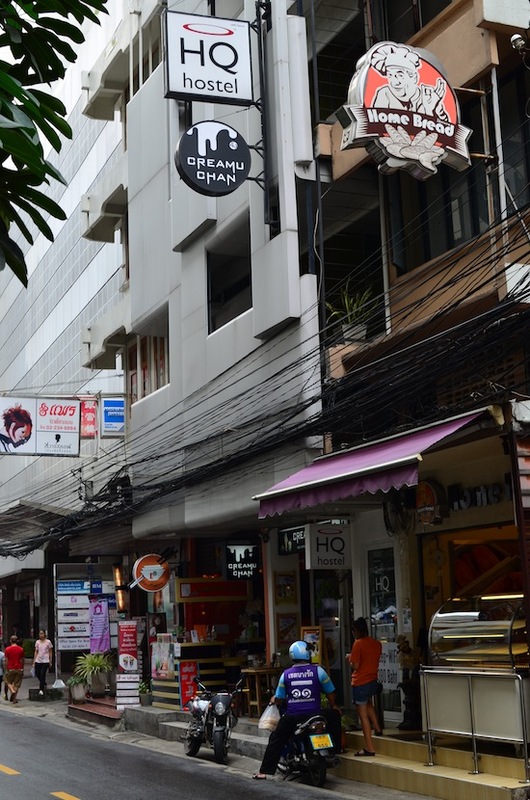 HQ is a five-minute walk from Chong Nonsi and Sala Daeng BTS skytrain stations, as well as Si Lom MRT subway station. Siam Square, Hualamphong train station and an interchange to the Sukhumvit line of the BTS system are all two stops away, while the central Chao Phraya express boat pier is three stops in the other direction. Frenetic at any hour, the immediate vicinity hosts an abundance of food and nightlife, and nearby Lumpini Park provides respite from the bustle. Though the tight spaces will be a turn-off for some, HQ’s fantastic location and smart, stylish ambiance will be a good fit for others. If you like the slick design and Silom location, you might also give Lub d or The Cube a try. A bit further down Silom Soi 3 at the end of a side alley, the similar C40 Winks Hostel is another fine option if you prefer a more low-key vibe. Check rates at HQ Hostel Bangkok on Booking.com. Six-person room for 390; four-person for 420; women-only for 450. Room: Dorm air-con, low season: 360 baht, high season 360 baht. Notes: Six-person room for 390; four-person for 420; women-only for 450.